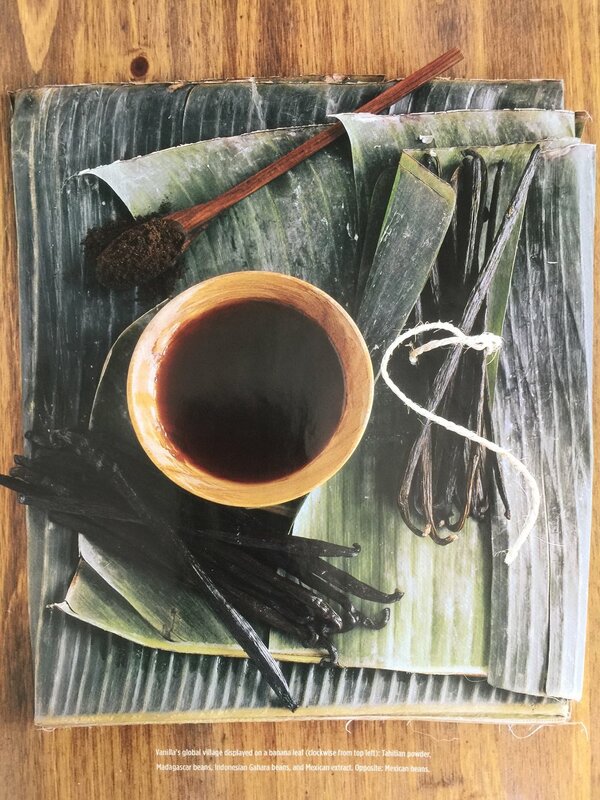 Rose’s Vanilla Bible was published in Food Arts magazine’s November 2003 issue (photos by David Prince). March 2018 we revised and added additional information to my article. Vanilla is one of the key indispensable ingredients in baking and even plays a role in savory cooking. I am grateful to Food Arts for having given me the opportunity to explore it further and to put together all the information I discovered in this article. In my view, the pastry world is divided between two different personality types: chocolate and vanilla, chocolate reflecting the heavy hitters and vanilla the more subtle and complex. I love both flavors but if I had to chose only one it would be simple: vanilla wins hands down, not only because I love its flavor but because it is one of those rare synergistic ingredients that enhances others. If chocolate is king, then vanilla is queen. And it is indeed the power behind the throne. Where, after all, would chocolate be without vanilla to round out its harsher, coarser characteristics. And in the domain of ice cream, vanilla reigns supreme as our number one flavor. Vanilla possesses an intriguing and powerful past going back to the Totonac Indians of the East Central Coastal area of Mexico. Taken as a conquering tribute by the Aztecs, where it was used in a drink called “Chocolatl” in the court of Montezuma, it was next acquired by the explorer Cortez (also written as Cortes) who introduced it to the royal court of Spain in around 1528. In the late 1500s they renamed it “Vainilla” meaning “Little Scabbard,” which the pods resemble. Vanilla was used uniquely for the chocolate drink in Spain for 80 years until 1602 when Hugh Morgan, apothecary to Queen Elizabeth I, suggested using it as a flavoring for other things such as sweet meats and candied fruits. In 1793 the vanilla vine was smuggled from Mexico to the Island of Reunion, then a French protectorate called Ile de Bourbon, hence the term Bourbon vanilla, referring to vanilla grown in this area. There are some who categorize vanilla as a spice, and as such, it comes second only to saffron as the most expensive one in the world, because processing is so labor intensive. But to my mind, vanilla is in a category of it own—perhaps more a perfume or an essence than a spice. Vanilla grows best in areas 10 to 20 degrees north or south of the equator in a hot moist tropical climate with year round temperatures of 75 to 85˚ F/24 to 29˚C. Primary produces of vanilla are Indonesia, Mexico, Tonga, Tahiti and the Bourbon Islands including Madagascar which is said to be the finest from this area which produces about 55% of the world’s annual supply of 1700 tons. According to the late Chat Nielsen Jr. of Nielsen Massey, the Madagascar “Bourbon” has a full rich creamy flavor, Mexican vanilla slightly spice like clove or nutmeg, Reunion vanilla also possesses a slightly sweet spicy note, and Comores vanilla has a balsamic quality. His son, Craig Nielsen, says his personal favorite is Madagascar for its “deep rich complex, classic vanilla taste. Tahitian is floral and fragrant but the flavor profile is one dimensional.” His take on Mexican vanilla is that it is virtually indistinguishable from Bourbon when added to other ingredients. Mexican vanilla fell into disfavor for a while because some unscrupulous producers were adding coumarin (an irreversible blood thinner) as a flavor enhancer. According to Zarella Martinez, successful efforts are now being made to produce organic first class vanilla in Papantla, the vanilla native region, by growers like Victor Vallejo and processors such as Heriberto Larios and Cesar Arellano. An organization has been formed (La Asociacion de Vainilleros de Papantla) and they have instituted rigid controls as to when the vanilla can be harvested. In addition only a few orchids are pollinated on each plant so that the beans that do grow are first rate. As of 2010, virtually all Mexican vanilla imported into the USA is coumarin free. The term “fold” refers to the strength of the vanilla extract, not the flavor. The FDA defines single strength (one-fold) as being made from 13.35 ounces of vanilla beans (about 100 beans), which contain less than 25% moisture, per gallon of liquid solvent. Specialty producers claim that their single strength is 10% stronger than most supermarket brands. Double strength (2 fold) uses two times the amount of vanilla bean per gallon of liquid solvent, triple strength 3 times, quadruple strength is 4 times after which it becomes supersaturated. Thirty folds is the highest concentration produced. In order to get to 10 fold concentration, 10 gallons of a 1 fold vanilla are put into a still and under pressure and vacuum the water and alcohol is drawn off, and it is reduced to 1 gallon of 10 fold. This concentration process also drives off flavor components so if reconstituted to 10 gallons it would not be the same. It is used in industry for convenience when working with large quantities of product. According to the FDA, vanilla labeled “pure vanilla extract” must contain at least 35% alcohol. (This is not to say that vanilla extracted in mediums other than alcohol is less “pure,” and may in fact be superior!) It may also contain vanilla seeds and ground pods. Sugar, dextrose and cornsyrup, coloring and preservatives are permissible but must be listed. According to Patricia Rain, in her “Vanilla Cookbook”, Celestial Arts Berkeley, Ca. 1986, manufacturers may use 5% to as much as 40% sugar to speed up the aging or mellowing process. Sugar is also used to prevent a muddy color, but if caramelized sugar is used it will produce a dark, often muddy color. Pure Vanilla Extract: Liquid vanilla extract is designated as a flavoring by the FDA when it contains less than 35% alcohol. You can have a pure vanilla flavoring that is less but it is not designated as an extract. Some manufacturers such as Euro Vanille refer to their product as “Pure Vanilla Extract” though they cannot technically have the FDA designation since it contains no alcohol. In this case, the vanilla is extracted either in alcohol or in carbon dioxide and this medium is then replaced by a glycerin medium, a more neutral propylene glycol medium, or an invert sugar. These varieties of vanilla are used in industry or by individuals who desire the flavor of natural vanilla without using the whole bean or an alcohol solvent. Because glycerin is a vegetable oil derivative, with a higher evaporation point, it dissipates less during baking than a vanilla in an alcohol base. I find that glycerin, when tasted alone has a distinctly bitter taste though in minute quantities and added to other ingredients this may not be perceptible. Euro Vanille and Searome both use inverted sugar to eliminate any bitter aftertaste. Vanilla Bean Paste This excellent product contains vanilla seeds combined with vanilla extract, natural gum thickeners, and a small amount of sugar, varying by manufacturer. Most can be used in equal volume to replace vanilla extract, but it is best to check the label for suggested amounts. Vanilla Bean Seeds The vanilla bean seeds add a subtle earthy depth of flavor and unique sweet quality, but the bean alone cannot offer the full depth of flavor. The extract, though easier to use, lacks the sweet roundness and in excess may even impart a bitter edge, hence the popularity of the vanilla pastes which offer a balance of complexity, richness and fullness of flavor. Vanilla paste, however, is not as strong as extract because it is not full strength or full extraction. It is, therefore, somewhat of a compromise. The ideal flavor profile would be a combination of extract and seeds, and second to that paste, and seeds. Vanilla Bean Powder Pure vanilla is also marketed in the form of a powdered bean, and also powdered with sugar. Though most of the flavor resides in the seeds, when the entire pod is used the resulting powder is coarser than the seeds alone and the flavor less subtle and delicate, delivering far more flavor impact but less depth of flavor than extract. Euro Vanille markets a powder that is 100% vanilla, using the bean and the seeds. Nielsen Massey’s vanilla powder has been encapsulated onto a maltodextrin (modified cornstarch) as opposed to the more usual dextrose base, which is much sweeter. The FDA allows pure vanilla powder to contain lactose, food starch, dried corn syrup, acacia, and an anticaking ingredients. TO SUM IT UP The major advantages of vanilla paste, vanilla bean seeds and vanilla powder over extract is that more can be used without resulting in bitterness, and that the flavor does not dissipate during cooking or baking. The major advantage of extract is richness and intensity of flavor and ease of disbursement in a liquid medium. Aaron Isaacson advises using paste in recipes that are not subjected to high heat, in conjunction with extra seeds to give the extra flavor boost that you would not have with just the bean alone. He says that the extra sugar in the paste also brings out more vanilla flavor, making it more complex, richer, more mellow and rounded. He advises using the essence or extract in combination with the bean for long baking such as cakes and crème brulée, because it is richer and more full bodied. Though some of it dissipates, there is still an uderlying flavor carried by the alcohol. Appearance: A vanilla bean should be dark brown, plump, glossy or oily, and flexible. It’s surface can display white vanillin crystals. If you look very carefully, you may even find a distinctive mark on a vanilla bean. Some growers actually brand each bean to prevent theft during processing! The average bean measures 5 to 6 inches in length, but some measure almost 8-3/4 inches in length, depending on variety. Those that are the ripest will tend to split sharply along their length. Sometimes you will notice a white substance coating the vanilla beans. This is usually not mold, it is most probably flavorful natural vanillin crystals which migrate to the surface. Some disreputable producers harvest this vanillin for other purposes, lowering the quality of the bean. According to Chris Broberg, beans still containing all their vanillin smell sweeter. He recommends always getting an analysis. To determine whether the white substance is mold or vanillin, simply touch your finger to the bean. If it is mold it will not disappear but if it is vanillin crystals, after a few seconds they will vanish. Taste: The best way to taste and compare vanilla is in bottled water or club soda sweetened with a simple syrup made by bringing 3/4 cup water and 1-1/2 cups sugar almost to a boil, stirring constantly until dissolved, held at that temperature for a few minutes stirring, then cooled to room temperature. Use about 1 quart of club soda to 6-1/2 tablespoons simple syrup to 1 tablespoon of vanilla. If the vanilla is of a higher concentration or fold, use proportionately less . Storage: Vanilla extract or paste is thought to improve on age, developing nuances, for perhaps as long as 5 years and even longer if stored under ideal conditions. If stored at too cool a temperature flavoring material may precipitate out requiring shaking before use. The ideal temperature for both extract, paste, and beans is 70 to 80°F/21 to 17˚C at low humidity, and not exposed to light. A plastic bottle or for the beans, a freezer weight airtight bag is preferable to glass which is porous. Beans stored in this manner will keep their freshness for up to 6 months. If vacuum packed they will stay fresh even longer. According to manufacturers, chilling or freezing destroys some of the esthers and flavor components. It is recommended, whenever possible, to add the vanilla at the end of the recipe, because heating changes the entire chemical nature of vanilla. Shirley Corriher, author of CookWise, when asked if there is a Southern traditional use for vanilla replied unhesitatingly: Yes; we put vanilla in everything sweet. Christian Delouvrier, of Lespinasse, finds that vanilla makes the meat or fish sweeter. One of his favorite uses is with lemon cured in salt in a sauce for foie gras. In industry, vanilla is used in soft drinks, Coca Cola being one of the major importers of Mexican vanilla. It is also used in perfumes, pharmaceuticals, cosmetics and tobacco. Chris Broberg, formerly of Petrossian, reports having enjoyed an inexpensive cigar that had been stored with vanilla beans, which imparted a sweet quality, particularly in the aroma. 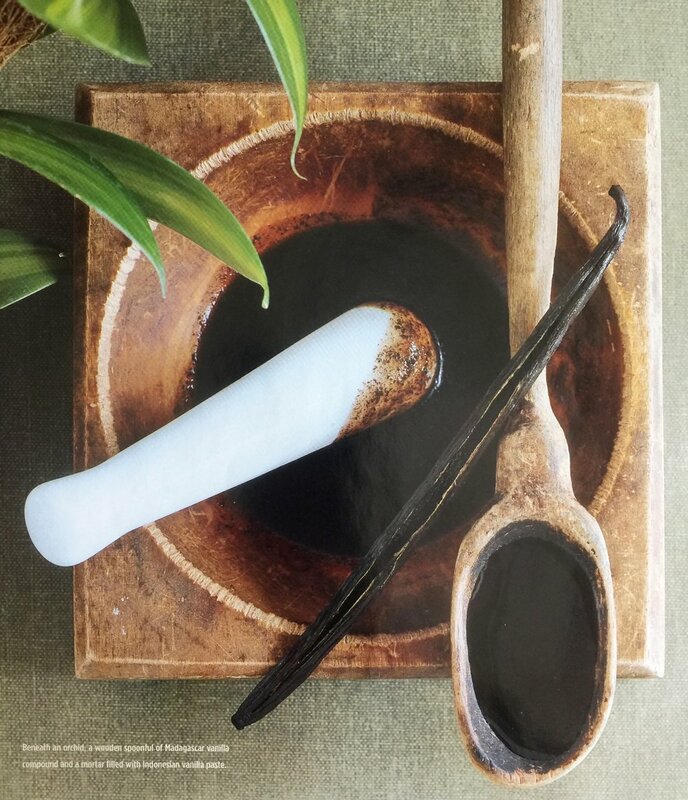 Jonathan Zearfoss, culinary professor at the CIA, in a class on aphrodisiacs, offered a recipe for vanilla bean infused mineral oil to be used as a perfume. 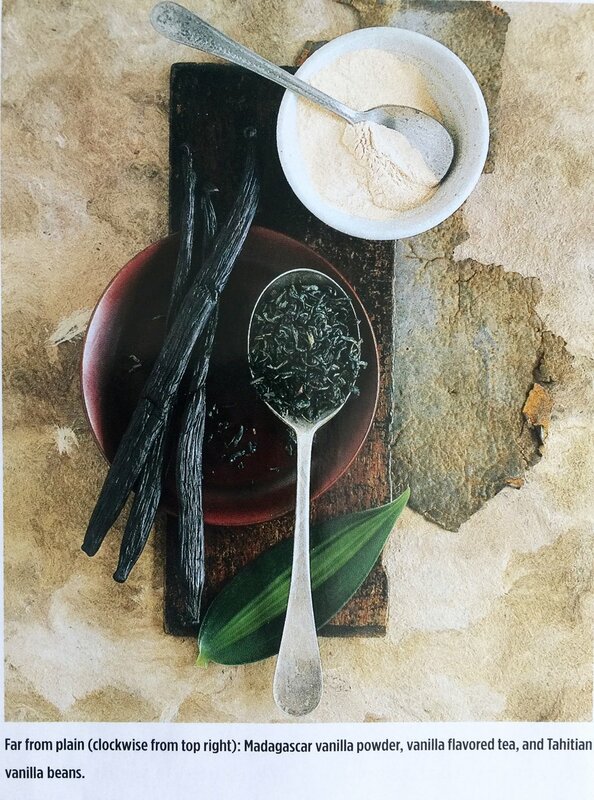 The most time-honored use for left over vanilla pods is to make vanilla sugar by burying the dried pods in the sugar. Pastry Chef Jean Philippe Maury formerly of the Bellagio in Las Vegas, recommends substituting this sugar for 8 percent of the weight of the sugar used in a recipe. Jacque Pfeiffer uses equal parts vanilla bean and powdered sugar to pulverize into a powder. Aaron Isaacson pulverizes the pod with sugar and triple sifts it to get rid of any extraneous matter that would cause bitterness. He uses this to replace as much as 30 percent of the sugar in cakes. He feels it is imperative to use vanilla sugar in cookies as with other forms of vanilla the flavor will to some to some degree bake out, however also adds some extract or essence for the additional flavor profile. For years I have added some of my spent vanilla beans to my baking countertop’s vanilla extract bottle, a precursor to the now ubiquitous vanilla pastes. I always keep the beans covered with extract to avoid molding. I also have a 8 quart rising container filled with sugar in which I have several dozen spent pods imparting their vanilla fragrance. Jean Francois Bonnet, of Tumbador, prefers Madagascar, in particular the Euro Vanille, because he finds Tahitian too strong but agrees that it works well with assertive tropical flavors such as passion. Chris Broberg, formerly of Petrossian, prefers Mexican, saying it is not as cloying as Tahitian, nor slightly fermented like Madagascar, nor smoky like Indonesian. He infuses it in syrups to flavor fruit and jams. Claudia Fleming, formerly of Grammercy Tavern, says we overlook this most precious of essences. She feels that vanilla has been neglected and pushed aside because of the trendy things being done and would like to resurrect it. She is serving a baked warm chocolate chiboust, with vanilla ice cream, using the bean and extract which boosts the flavor, with a vanilla bourbon sauce. Johnnie Iuzzini, TV celebrity chef and formerly of Restaurant Daniel, finds Madagascar richer and sweeter than Tahitian which he feels is more aromatic but less flavorful. He says that vanilla can stand on its own but complements and rounds out a lot of desserts—things you want to keep simple yet add a little flavor. He uses vanilla with fresh fruits such as a fruit soup with melon and a little elderflower water, or in a fresh cream to give it a ripe non-processed flavor. He likes vanilla in invert sugar from Sevarome as it incorporates easily into other things but employs vanilla bean ground with sugar in tarts, sifted to take out any chunks. Emily Lucetti, of Farralon, uses Tahitian in ice cream and panaccota where it is the main flavor and Madagascar (due to the greater expense of the Tahitian) in applications where it is more masks by other flavors. She says it used to be an accent flavor and now is a primary flavor and has emerged in its own right. Nancy Oakes, chef/owner of Boulevard, adds vanilla to her brining liquid for meat.